Last year, I introduced you to Stanley Rondeau whose great-great-great-great-great-great-grandfather Jean Rondeau was a Huguenot silk weaver who came to Spitalfields in 1685 as a refugee fleeing religious persecution in Paris. Jean’s son prospered in Spitalfields, becoming Sexton at Christ Church, having eleven children, building a new house at 4 Wilkes St and commissioning designs in the seventeen forties from the most famous of silk designers, Anna Maria Garthwaite, who lived almost next door, in the house on the corner with Princelet St. 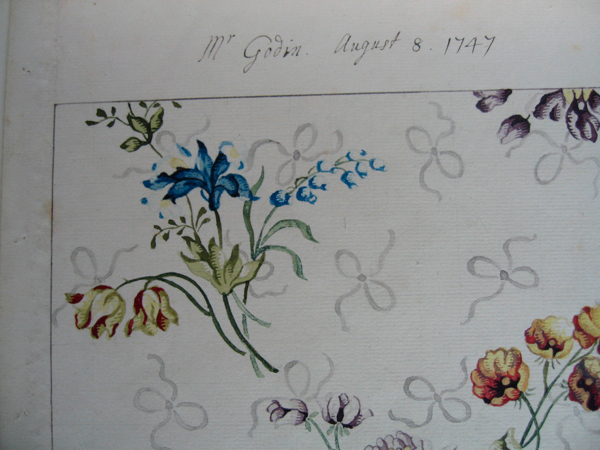 Since Anna Maria Garthwaite’s designs were exceptionally prized both for their aesthetic appeal and their functional elegance as patterns for silk weaving, hundreds of her original paintings have survived to this day. So yesterday, Stanley & I went along to the Victoria & Albert Museum in Kensington to take a look at those done for Stanley’s ancestor Jean the Sexton, two hundred and seventy years ago. We negotiated our way through the labyrinths of the vast museum, teeming with school children, with a growing sense of anticipation because although Stanley has seen one of the designs reproduced in a book, he has never cast his eyes upon the originals. And up on the fourth floor, we entered a sanctuary of peace and quiet where curator Moira Thunder awaited us in a lofty room with a long table and large flat blue boxes containing the treasured designs that were the objects of our quest. Moira – chic in contrasting tones of plum and navy blue, and with a pair of fuchsia lenses which hinted at a bohemian side – welcomed us with scholarly grace, and duly opened up the first box to reveal the first of Anna Maria Garthwaite’s designs. 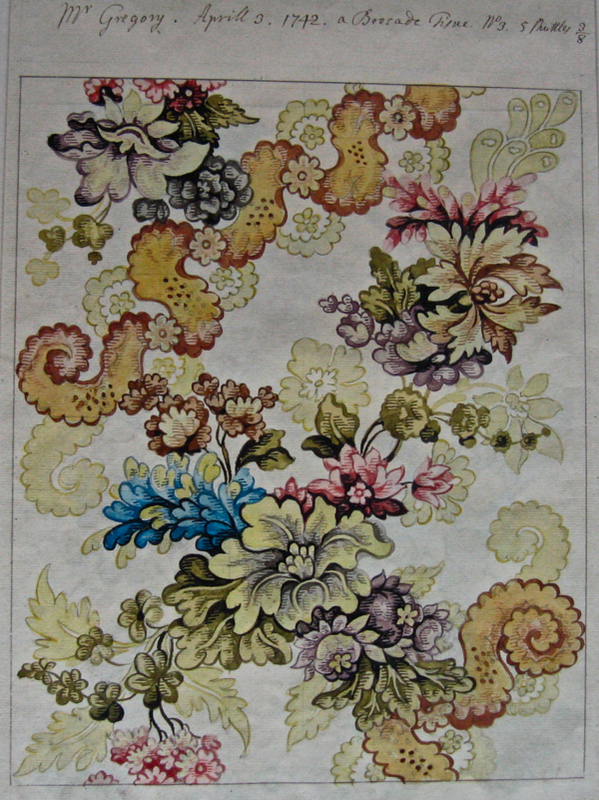 Drawn in the wide margin at the top of a large sheet containing an elaborate floral number, this design was the epitome of restraint with a repeated motif that resembled a bugle flower in subdued tones of purplish brown, labelled “Mr Rondeau, Feb 5 174 1/2,” and intended as a pattern to be woven into the body of a vellure used for men’s suiting. Mr Rondeau of Feb 2011, instinctively drawn towards his own name revealed before him, leaned forward to touch the piece of paper – which caused Moira’s eyes to pop, though fortunately for all concerned the priceless design was protected by a layer of transparent conservator’s plastic. Once smiles of amelioration had been exchanged after this faux-pas, Stanley enjoyed a quiet moment of contemplation, gazing with his deep-set chestnut eyes from beneath his bushy white eyebrows upon the same piece of paper that his ancestor saw. I think Stanley would have preferred it if “Mr Rondeau” had been written beside the fancy design below, because he asked Moira whether the other design for Jean Rondeau in the collection was more colourful but, with an unexpectedly winsome smile, Moira refused to be drawn. Yet while Stanley’s curiosity was understandably focussed upon those designs attributed to his ancestor, I was enraptured by the myriad pages of designs by Anna Maria Garthwaite, whose house I walk past every day. Kept from the daylight, the colours in these sketches remain as fresh as the day she painted them in Spitalfields three centuries ago. The accurate observation of both cultivated and wild flowers in these works suggests they were painted from specimens which permits me to surmise that she had access to a garden, and picked her wild flowers in the fields beyond Brick Lane. 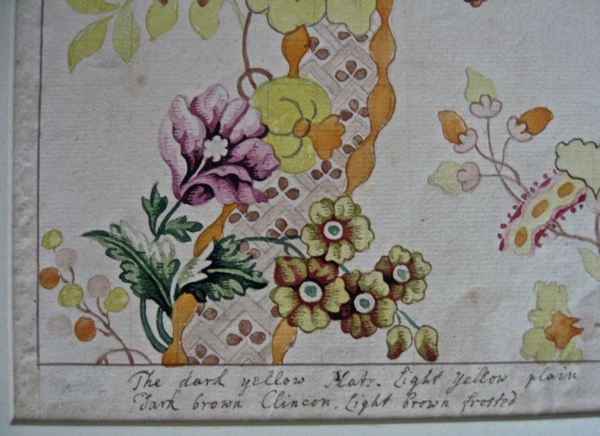 I especially admired the sparseness of these sprigged designs, drawing the eye to the lustrous quality of the silk, and Moira, who worked as assistant to Natalie Rothenstein - the ultimate authority on Spitalfields silk – pointed out that weavers rarely deviated from Garthwaite’s designs because they were conceived with such thorough understanding of the process. And then, Moira opened the second box to reveal the second design by Anna Maria Garthwaite for Jean Rondeau, which Stanley had never seen before. Larger and more complex than the previous, although monochromatic, this was a pattern of pansy or violet flowers divided by scalloped borders into a repeated design of lozenges. 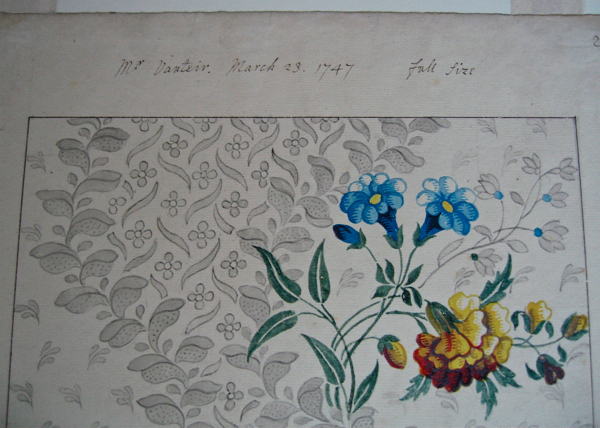 Again drawn in the margin, at the top of a piece of paper above a multicoloured design, this has the name “Mr Rondeau” written in feint pencil beside it. It was a design for a damask, either for men’s suiting or a woman’s dress, which Moira suggested would be appropriate to be worn at the time of half-mourning. A degree of formalised grief that is unfamiliar to us, yet would have been the custom in a world where women bore many more babies in the knowledge that only those chosen few would survive beyond childhood. 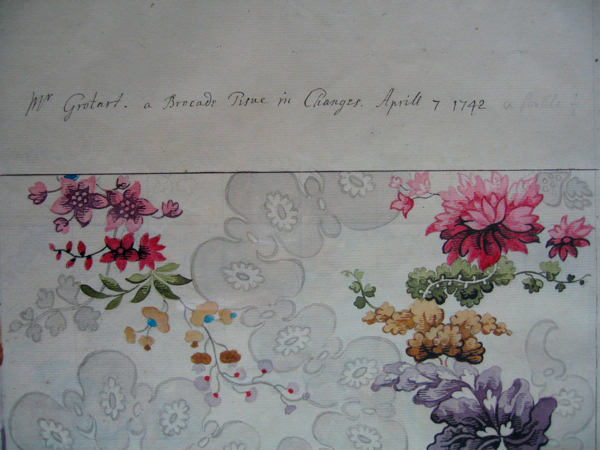 Moira took the unveiling of this second design as the premise to outline the speciality of Master Silk Weaver Jean Rondeau, who appears to have built his fortune, and company of fifty seven employees, upon the production of cheaper silks for men, unlike his Spitalfields contemporary Captain Lekeux – for whom Anna Maria Garthwaite also designed – who specialised in the most expensive silks for women. In reponse to Moira’s erudition, Stanley began to talk about his ancestor and the events of the seventeen forties in Spitalfields with a familiarity and grasp of detail that made it sound as if he were talking about a recent decade. And as he spoke, with the unique wealth of knowledge that he has gathered over a lifetime of research, I could see Moira becoming drawn in to Stanley’s extraordinary testimony, revealing new information about this highly specialised milieu of textile production which is her particular interest. 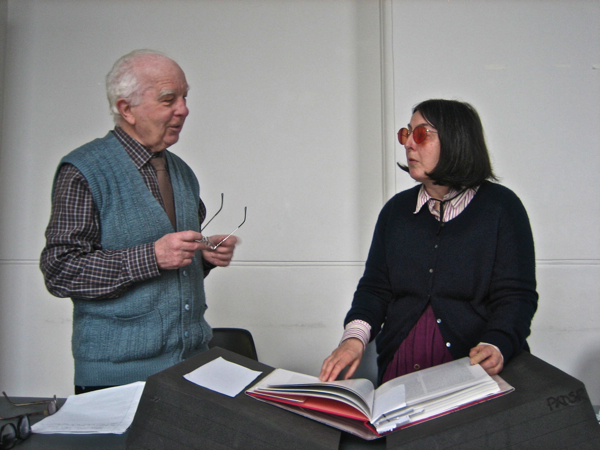 It was a true meeting of minds, and I stood by to observe the accumulation of mutual interest, as with growing delight Moira and Stanley exchanged anecdotes about their shared passion. Recently, Stanley visited the Natural History Museum to hold the bones of his ancestor Jean the Sexton which were removed there from Christ Church for study, and by seeing the designs at the Victoria & Albert Museum that once passed before Jean’s eyes in Spitalfields, he had completed his quest. 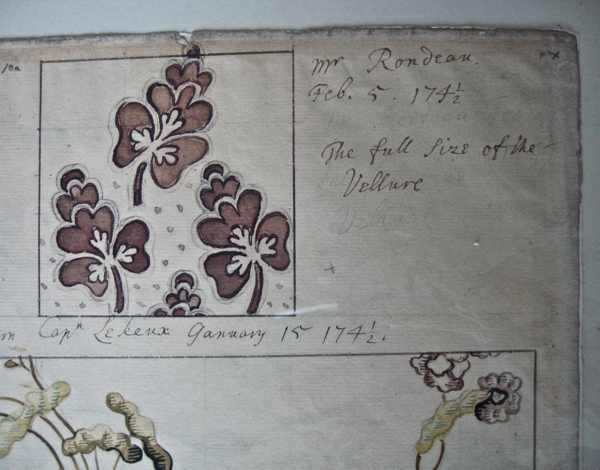 But there was a surprise in store, when Moira revealed that there were other textile designs from the nineteenth century commissioned by another Mr Rondeau who might be a descendant – but due to a forthcoming refit of the department Stanley would have to wait until 2012 to see them. “It was a big day,” Stanley admitted to me afterwards, his eyes shining with emotion, as he began to absorb the reality of what he had seen. “I’ll wait a year, and then I’m going to come back,” he added with grin of determination. It was a cliffhanger, because who knows what extravagant designs of high-flown Victoriana Mr Rondeau of the nineteenth century might have commissioned, in contrast to the understatement of his eighteenth century predecessor? But whatever Stanley Rondeau discovers, I have no doubt that the gracious Moira Thunder will be waiting to greet him upon his return to the V&A. 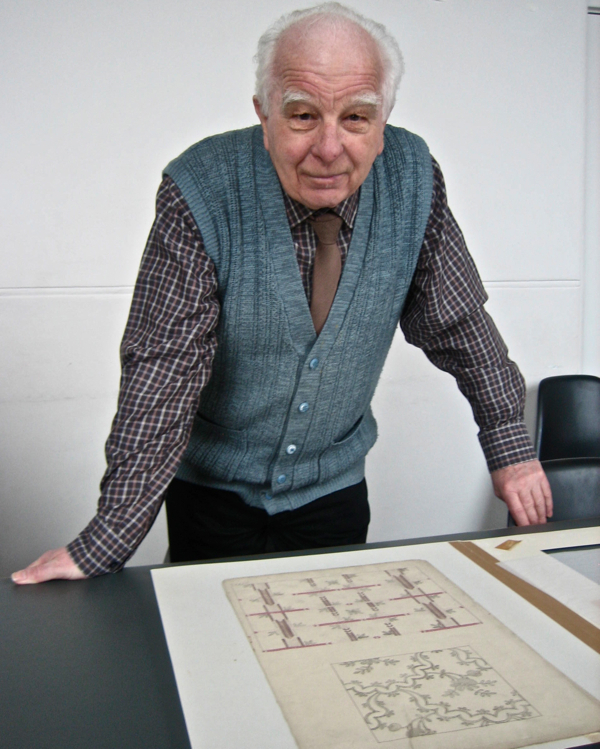 Stanley Rondeau sees the design commissioned by his ancestor in the seventeen forties for the first time. 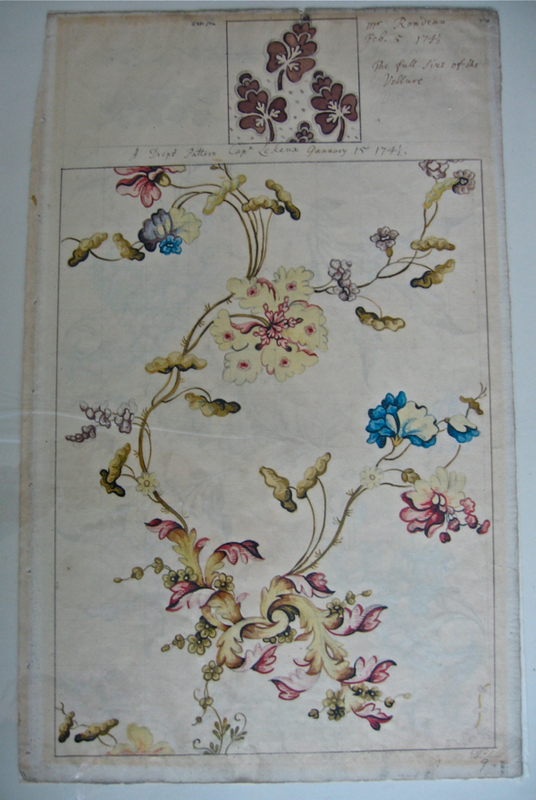 Design for a vellure for Jean Rondeau, by Anna Maria Garthwaite, Spitalfields, February 5th, 1741. The full page with Jean Rondeau’s design at the top. 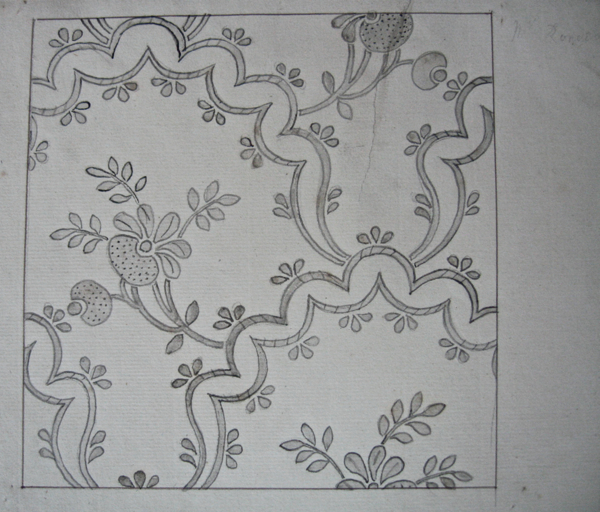 Design for a damask by Anna Maria Garthwaite for Jean Rondeau, possibly for half-mourning. 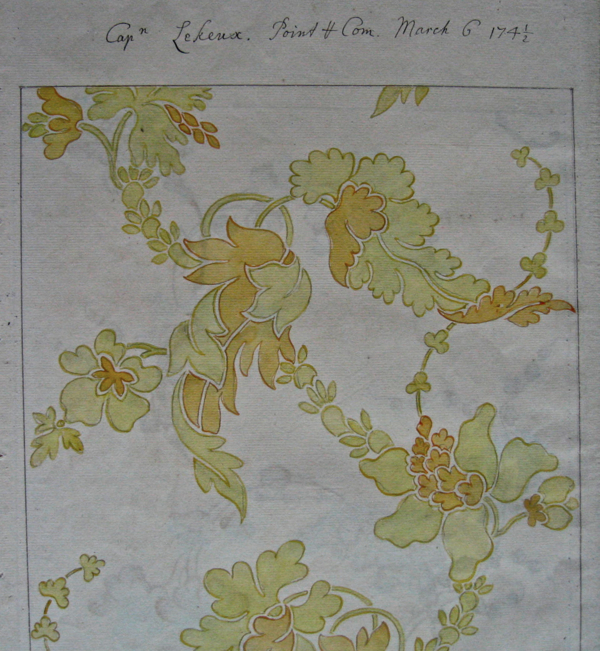 Anna Maria Garthwaite’s catalogue of designs. Designs by Anna Maria Garthwaite for Spitalfields silks from the seventeen forties in the collection of the Victoria & Albert Museum. With grateful thanks to Moira Thunder of the Victoria & Albert Museum for making this possible. These designs are beautiful and it’s amazing that the images have retained their color. I am very jealous! I am also, of course, very grateful to you both for giving me and others the chance to see these. Please keep writing about the Rondeau’s, it is really interesting. Seeing pictures of the designs that I will probably never see in real life brings my family history alive. I’m related to Jean Rondeau, John (The Sexton) Rondeau and Stanley Rondeau. I’m also eagerly awaiting next year when the “Victorian Rondeau” is revealed. Claire commented on another of your stories about Stanley Rondeau saying she was related to Ellen Rondeau (1885-1960). Claire, if you’re reading this, please contact me using the link to my web site. Ellen Rondeau was my great grandmother. Wonderful to read this, especially out here at the edge of the world, Vancouver BC, where anything 150yrs old is ancient. I greatly enjoy your posts. These silk designs are truly beautiful and so vivid. This post captures the excitement of someone coming into physical contact with their heritage. I share Stan’s Rondeau roots, so this has made my day. Thank you very much. Dear Gentle author, thank you from the Huguenot descendants of distant Australia for that sensitive and moving tribute to Anna Maria Garthwaite and to the silkweavers of Spitalfields. Many of our ancestors were silkweavers who worked so hard, and for little reward, to produce these beautiful fabrics. Merci bien, cher ami. Stanley, You are to be commended for all the research you have done regarding the Rondeau family. My ancestor was Susannah Rondeau 1791 – 1821 who married Andrew Larcher 1791 – 1868. 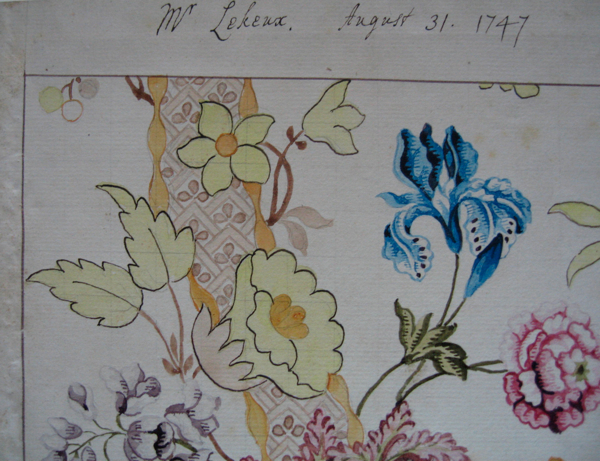 I wonder if you have any information on the Larcher family, also silk weavers from the area? Or can point me in the direction to begin some research. John Rondeau and I are 1st cousins seven times removed. I hope some day to see some of his work. Thank you Stanley. 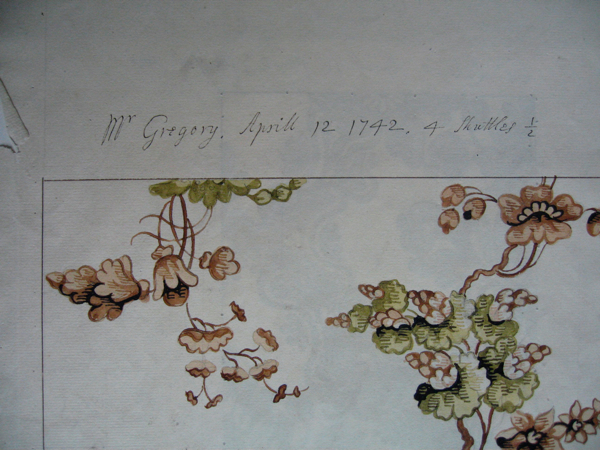 Hello, was so pleased to see your blog in regards to your family’s heritage and the beautiful Huguenot designs shown. We live in the area of Manikintowne, Virginia, the original settlement of over 160 Huguenot families in the early 1700s, Abraham and Sallie Michaux, along with their descendants are buried in the Michaux St. James cemetery across from our now restored chapel, presently being used as a community center, and many Huguenot homes still existant. 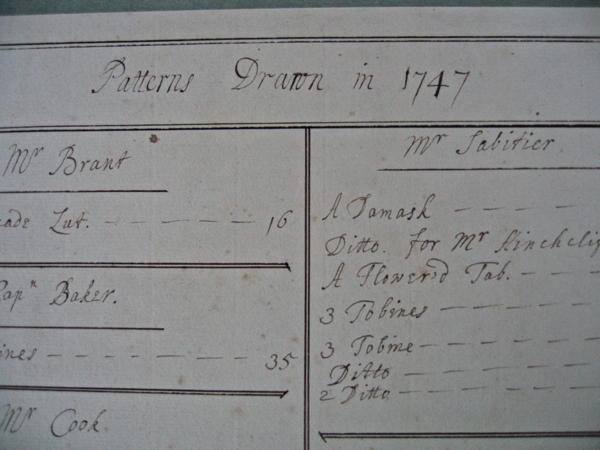 We have become interested in perhaps replicating, patterns of Huguenot textiles, as I researched so many of the original settlers hereabouts were from the Spitalfields area of London. If you were in knowledge of any source, or families such as yours, who have left pattern collections, how wonderful it would be to show a display of them in our Huguenot History collection. We have a wonderful curator of documents at the Virginia State Library, and a lovely early textiles collection of fabric and clothing located at our Valentine Museum in downtown Richmond. It would be most intriguing to have a display or have a block printing done of early Huguenot textiles, fabrics, household textiles etc. wherein we may give homage to our earliest settlers here. It’s a beautiful rural area that we live in, and while the first settlers here had a most difficult time, building their lives, here, as their skills were less in farming, than in textiles, we see how well, they acclimated and became citizens of some note, and pride. My husband and I will be coming back for a visit in June, and are looking forward to exploring the Spitalfields area, and revisiting the V&A remembering how very much we especially enjoyed our time there. Have you considered working with a fabric company to recreate your family’s legacy designs? Must be very exciting! And should you have any ideas in regards to our linking American Huguenot heritage and the silk weavers of Spitalfields it would be grand to hear from you. Take care, and wish you well. LeeAnne Tetrault, 4053 Old River Trail, Powhatan, Virginia 23139 USA. 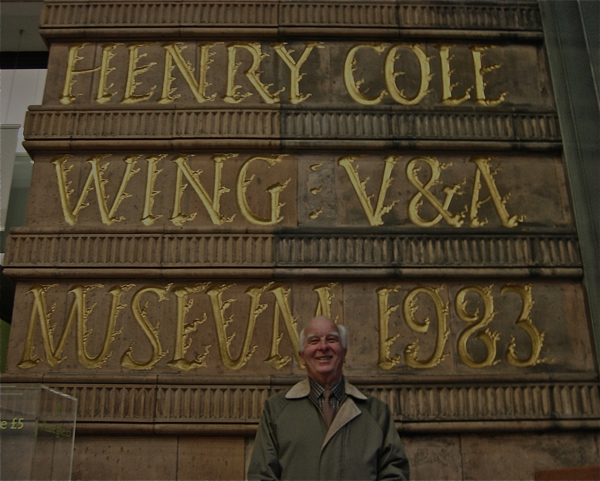 Did Stanley return to the V&A in 2012? Would love to know the update!